Jamaica Pond is in the Jamaica Plain neighborhood of Boston, Massachusetts, and was first included in Boston's "Emerald Necklace" of parks in 1892. Many people enjoy walking or running on the 1.5 mile path around the pond. Street parking can be found on Perkins Street , on the pond's west side. A natural "kettle" depression formed by glacial action, the pond itself covers about 68-acres, and has an average depth of 25 feet; it is 53 feet deep near the center. Fishing is allowed with a Massachusetts fishing license. The pond is stocked each year by the Massachusetts Division of Fisheries and Wildlife . Sailboats, rowboats, and kayaks can be rented at the Jamaica Pond Boat House, which is administered by the Courageous Sailing Center . The Boathouse is open from Patriot's Day weekend through Halloween. The Boat House is open Noon to Sunset on Monday through Thursday, and 10am to Sunset on Friday, Saturday, and Sunday. Boats usually are rented whenever the boathouse is open. Courageous Sailing offers youth sailing programs for Boston residents. For more information, in season, call the Boat House at (617) 522-5061. A hundred and fifty years ago, wealthy Bostonians had country homes around Jamaica Pond. 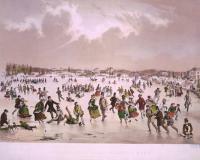 The pond was a source of ice and a popular place to skate in the winter. Bufford, J.H., lithographer. "Jamaica Pond, West Roxbury, Massachusetts." Color lithograph. 1859. Prints and Photographs Division, Library of Congress. Signs posted around the Pond announce rules: the park closes at 11:30; the path is for pedestrians only; no swimming or wading, alchoholic beverages, or unauthorized vehicle access; keep dogs on a leash and clean up after them; and use trash barrels. Check the signs for more details. Please send comments, updates, and corrections to admin1 at jamaicapond.com.